You can save a baseline at any time by opening the Set Baseline dialog box in Project 2013. One setting — which controls how Project rolls up data to summary tasks when you set a baseline for part of the tasks — requires explanation. 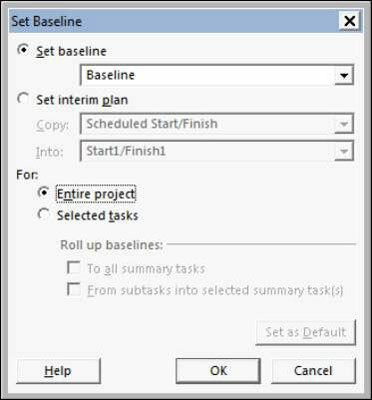 After you save a baseline the first time in Project 2013, the baseline data of a summary task is updated, by default, if you make changes to a subtask below it, such as changing the schedule for a subtask or deleting it. However, when you’re saving the baseline for only a selection of tasks, you can change that functionality by making a choice about how the baseline rolls up, or summarizes, data. You can choose to have modifications rolled up to all summary tasks or only from subtasks for any summary tasks you select. This second option works only if you’ve selected summary tasks and haven’t selected their subtasks. To use rolling wave planning, save a baseline for only selected tasks. In other words, perhaps you’ve sufficiently detailed the early tasks in the first phase or first month or two of a large project, and you’re ready to commit to that part of the plan, but the latter detail still remains to be hammered out. Saving a baseline for earlier tasks allows you and the team to get working on those tasks while allowing for the progressive detailing of later tasks down the line. To save a baseline for only certain tasks, select them by dragging over their task ID (row) numbers. The Set Baseline dialog box appears, with the Set Baseline option selected. Select either the Entire Project or the Selected Tasks radio button. If you chose Selected Tasks in Step 3, make selections for how the baseline rolls up changes to task data. You can summarize changed data in all summary tasks or for only selected summary tasks. Click the OK button to set the baseline.